Premium Neutrik cord male 3 pin XLR connector with silver plated contacts, silver shell, solder termination. Premium Neutrik cord female 3 pin XLR connector with silver plated contacts, silver shell, solder termination. Premium Neutrik cord male 3 pin XLR connector with gold plated contacts, black shell, solder termination. Premium Neutrik cord female 3 pin XLR connector with gold plated contacts, black shell, solder termination. 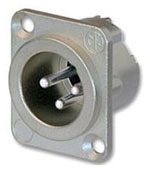 High quality Amphenol cord male 3 pin XLR connector, silver shell, solder termination. High quality Amphenol cord female 3 pin XLR connector, silver shell, solder termination. Economy Pro-Signal cord male 3 pin XLR connector, solder termination. Economy Pro-Signal cord female 3 pin XLR connector, solder termination. 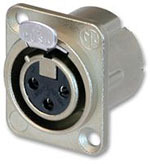 Premium Neutrik panel male 3 pin XLR connector with silver plated contacts, silver shell, solder termination. 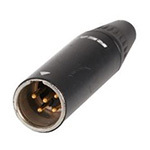 Premium Neutrik panel female 3 pin XLR connector with silver plated contacts, silver shell, solder termination. 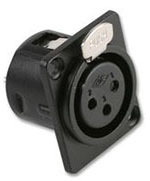 Economy Pro-Signal panel male 3 pin XLR connector, black shell, solder termination. 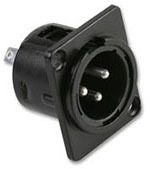 Economy Pro-Signal panel female 3 pin XLR connector, black shell, solder termination. Rean 3 pin cord female mini XLR, gold contacts, solder termination. Rean 4 pin cord female mini XLR, gold contacts, solder termination. Rean 5 pin cord female mini XLR, gold contacts, solder termination. Rean 3 pin cord male mini XLR, gold contacts, solder termination. Rean 4 pin cord male mini XLR, gold contacts, solder termination. Rean 5 pin cord male mini XLR, gold contacts, solder termination. Rean 3 pin panel male mini XLR, gold contacts, solder termination. Rean 4 pin panel male mini XLR, gold contacts, solder termination. Rean 5 pin panel male mini XLR, gold contacts, solder termination. If you cannot find what you are looking for please ask us. Please note we do not have a retail store you can visit. Purchases may be collected by arrangement only, please call.